Historic Timberline Lodge. Timberline Lodge was saved from being burned to the ground by the late Richard L. Kohnstamm. He convinced the Forest Service to let his start-up company take it over, the lodge was carefully restored and it has been maintained since then through the work of the Friends of Timberline Lodge and substantial public funds. The historic outdoor amphitheater was restored, a new entrance to the lodge was built, the guest rooms were lovingly restored and its many offerings in the interior and exterior were kept faithful to the past. Today, millions of visitors enjoy this one-of-a-kind lodge high on Oregon’s iconic Mt. Hood. 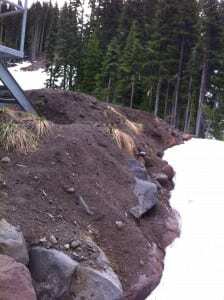 Unfortunately, the mountain environment around the lodge and underneath the ski runs has not been so easy to lovingly care for after the soils and vegetation have been disturbed by construction. In the winter months, snow covers the land making it appear quite lovely. What lies beneath the snow in many cases is not. Flagging from the Proposed Bike Routes In a Natural Meadow. Many of these routes would be almost 100 inches wide. 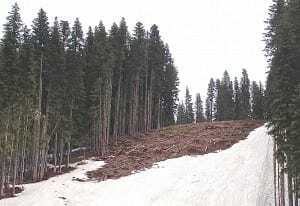 While some of the ski runs are beautiful high mountain meadows, other ski runs are clearcuts that are still in a seriously degraded condition. Now more than 6 years since the Jeff Flood Express was built and those runs were cut, the attempted restoration still has not worked. A high density of roads, cut banks and landing pads from past lift construction collectively deliver tons of sediment into the headwaters of the Sandy River Basin’s Still Creek and West Fork of the Salmon. The Forest Service has documented that the aquatic system is in a chronic non-functioning condition. The Forest Service hinged allowing the degradation from new construction for the Downhill Mountain Bike Trails and Skills Park on the immediate success of challenging restoration projects. The construction of the Downhill Bike Park will result in 12 acres of bare mineral ground and most of the miles of new bike routes will carved into land that is currently natural and not degraded. The new construction will therefore add more disturbance and degradation on top of the existing chronic condition. The bike routes will also double the number of routes that cross streams in the area, and thereby further increase the chances that sediment will get into the streams. To approve the bike trails, the Forest Service proposed a suite of restoration projects as a substitute for and a means to try to cancel out the degradation and disturbance from the new bike trails. However much of the restoration will not be effective for several years to a decade. The Bottom of the Jeff Flood Express is still bare more than six years since construction. The best available science on restoration work undertaken in the high-elevations of the Sierra Nevada, Interior Columbia Basin and Pacific Northwest Cascades tell us that even after investments in thorough road obliteration the functional ecological equivalence of that work 10 years later is about 70% of the original condition. In other words, the restored land is still 30% compromised ten years after road restoration using the best-of-the-best in restoration techniques. The bottom line is that there is work to do on the high alpine flanks of Mt. Hood underneath the slopes and the benefits of that work will take a substantial amount of time be realized. The very high density of service roads and the disturbed base areas around the lift towers all contribute to the non-functioning condition. During spring run-off the roads, the disturbed lift bases and clearcut areas deliver tons of sediment into the headwaters of the West Fork of the Salmon River and Still Creek. Still Creek and the West Fork of the Salmon are cool, clear mountain streams that are important for Winter steelhead, fall and spring Chinook, coho and aquatic life. But as the snow melts, water moves off the mountain at a rapid pace and with it high levels of salt, fine sediment and turbidity. Steelhead critical habitat starts right at the base of the Jeff Flood Express lift. The West Fork of the Salmon River contains the best known population and habitat for the Scott’s Apatanian caddisfly. The caddisfly is fish food, and is a glacial relict species that gets its sustenance from scraping the algae off the rocks in the West Fork. 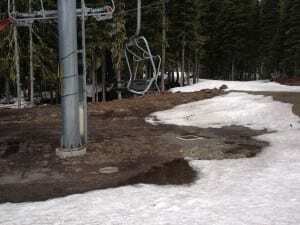 On top of all that the operators of Timberline Lodge – RLK and Co. – recently floated a master plan to build a Day Lodge and a 800 Car Parking Lot and then shortly thereafter amended the master plan to add the construction of 17 miles of downhill bike routes in the same watersheds. 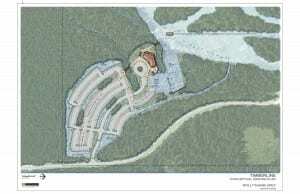 The master plan for the new base lodge, parking lot and downhill bike trails was never presented to the public for comment nor did the Forest Service ever analyze the cumulative effects of all this new development on the mountain before taking action to amend RLK’s Special Use Permit. Instead, RLK sought to move forward with the construction of the downhill bike trails in the headwaters of Still Creek and the West Fork of the Salmon while knowing the details of two other large scale projects in the same watershed. 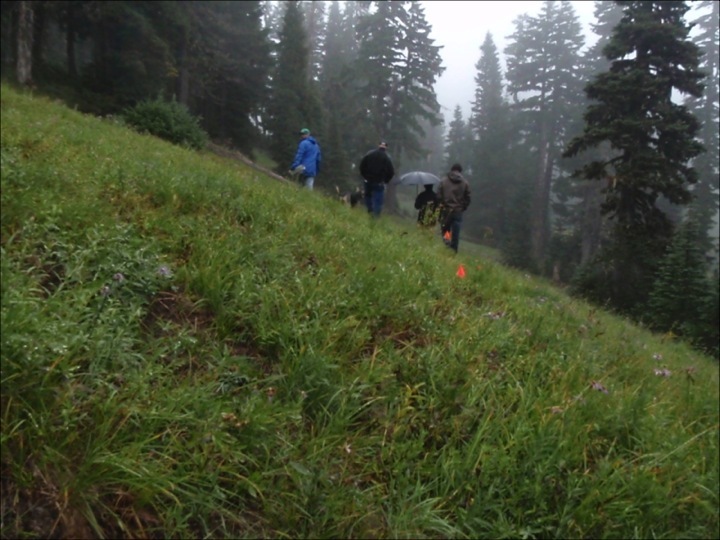 When Forest Service specialists assessed the current condition of the landscape they found problems with invasive weeds, failed restoration from past lift construction and documented the chronic non-functioning conditions in the aquatic system. One of many telling examples is that the amount of fine sediment in both Still Creek and the West Fork of the Salmon is more than 2 times the legal limit allowed by the Mt. Hood National Forest Plan. impact on the aquatic system. The conservation groups were informed on the issues by the opinion of experts with the Sandy Basin Watershed Council and the Forest Service’s own specialists. In addition, when the project was first proposed, Crag Law Center agreed to help a diverse coalition of local conservation groups and recreation interests take a thorough and rigorous independent scientific look at the impacts of this project. The project was assessed to determine whether it would be in compliance with federal laws that are in place to protect native fish and salmon. 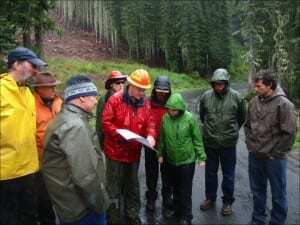 Crag retained expert hydrologist Jonathan J. Rhodes and presented the Forest Service with scientific studies that contradicted the agency’s key assumptions, including the Forest Service’s own studies from its own scientists. In support of claims regarding restoration the Forest Service used models without disclosing their limitations in this environment. The Forest Service cited a study from the Piedmont of Virginia on rates of erosion and recovery from a soil type, elevation and condition so drastically unlike that found on Mt. Hood. The Forest Service did not cite any science in support of its claims that the damaged areas would be immediately restored. Overall, the Forest Service simply refused to respond head on to the scientific studies that directly contradicted its claims that the damaged areas would be immediately restored and its key assumptions that downplayed the impact of the new construction on the aquatic system. No Environmental Impact Statement. At the end of 2012, the Forest Service finalized an Environmental Assessment, which is the document required by federal law to determine whether a project may have a significant effect on the landscape, aquatic system and other elements of the human environment. In the EA, the Forest Service must disclose all past, present and reasonably foreseeable future projects that would have a potentially significant effect on the environment. The Forest Service must ensure its action complies with the Northwest Forest Plan, the Mt. Hood National Forest Plan, the Clean Water Act and any other applicable laws, and in conjunction with looking at the impacts it must involve the public in planning. The Decision – No Significant Impact. Dkt 1 – Complaint). Crag Law Center is assisting this coalition by presenting to the independent audience provided by our nation’s federal courts. Risky Attempts to Restore the Degraded Landscape Counted to Comply with the Forest Plan Standards. While there may be a need for more mountain biking opportunities on the Mt. Hood National Forest, what became quite clear after just a couple field visits was that the ski area operator had not followed through on its promises to steward the land. In some cases, the restoration work that was promised after the construction of the Jeff Flood Express lift was attempted and failed. In other cases, it was not even attempted. Substituted Restoration for Habitat Degradation. So how could the Forest Service approve more construction and more impacts if the system was so far out of whack? The Forest Service has proposed substituting restoration to try to cancel out the degradation and sediment that the new downhill bike routes would cause. This approach violates direction in the Mt. Hood National Forest plan forbidding the substitution of more habitat degradation with restoration in wetland areas and key watersheds. The core problem was that that the Forest Service had to assume that the proposed restoration would be immediately effective at restoring the degraded conditions despite the highly erosive soils, poor growing season and ample empirical evidence that previous restoration attempts had failed. At bottom, this case is not about whether downhill mountain biking is good or bad. Of course we here at Crag love all things bike. Instead, this case is about whether plans to restore the landscape will work. And, given RLK and Co.’s master plans, this case is also about the historic future vision of Mt. Hood, access and traffic, and whether there will be a public process on the master plans for the mountain or whether the Forest Service can allow a developer to strategically piecemeal its development plans to avoid public involvement and a hard look at the true effects of development on the mountain. The conservation groups that have brought this lawsuit are all for more mountain biking opportunities provided the environment is protected. There are plenty of options where mountain biking can be expanded in the Mt. Hood National Forest to provide a greater diversity of gravity-fed lift-assisted downhill mountain biking terrain, whether at Ski Bowl’s adventure park or on the extensive legacy of roads for those mountain bikers that want to earn their downhill turns. 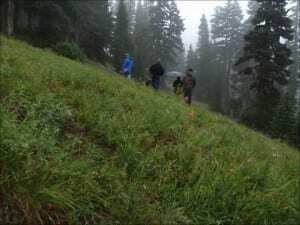 Oregonian – Environmental Groups Sue to Stop Bike Park. Salt? How can that be? Well, Timberline uses over 1,000,000 pounds of salt annually to preserve the snow pack for summertime ski camps. The salt makes its way into the aquatic system and negatively impacts fish and aquatic life. Pollution? Well, yes dirt is pollution. Mt. Hood’s fragile soils have a high content of ash, and once the soils are disturbed by road building and lift construction more and more of this fine sediment is released and plugs up the aquatic system. The dirt from the bike park is know in scientific speak as “fine sediment” and becomes “embedded” (stuck) in Still Creek and the West Fork of the Salmon River. According to the Forest Service, neither of these systems have the capability (high enough volumes of water and gradient) to be able to flush these fine sediments out quickly. This fine sediment is really hard on fish and the aquatic life that provides the food for them because it smothers the rocks and substrate upon which aquatic life depends. The Project: What is it? You can do your own search for videos and photos using the internet of downhill mountain biking activities on Mt. Hood. This project will convert 12 acres total into 17 miles of trails up to 99 inches wide. The project will cover hundreds of acres of land from above Timberline Lodge down to the bottom of the Jeff Flood Express. The total elevation gain is over 2,000 feet. Who will use the bike trails? The system is proposed to be built for all ability levels. You can do your own search online to get sense of who will be using the facilities, and a video on Vimeo of the Fluidride Pro Route at Ski Bowl might give you a sense of the width of the routes and the condition of those routes in a lower elevation, somewhat less fragile soil and environment. Ski Bowl has an adventure park which is going strong in the summer months. You can visit yourself and see the bike routes that have been carved out of the mountain there, and judge for yourself if you think an adventure park is compatible with Historic Timberline Lodge, the Timberline Trail, the Mountaineers trail and the high-alpine flanks of Mt. Hood. How are bike trails like roads? Forest Service hydrologist Todd Parker stated that the trails will function as roads do on the landscape: extending the drainage network, delivering sediment at stream crossings, intercepting above ground flow, altering the ability of the soil to allow water to infiltrate. Some of the proposed routes will be like trails and will be built initially as more narrow single track. Other trails will be far wider, up to 99 inches wide, which is more like a wide urban bike path than a trail. What Does the Landscape Look Like Now?